This sweet and colorful Blueberry Balsamic Salad is a perfect, weeknight, lazy-night solution for when you need something to go with that frozen pizza. 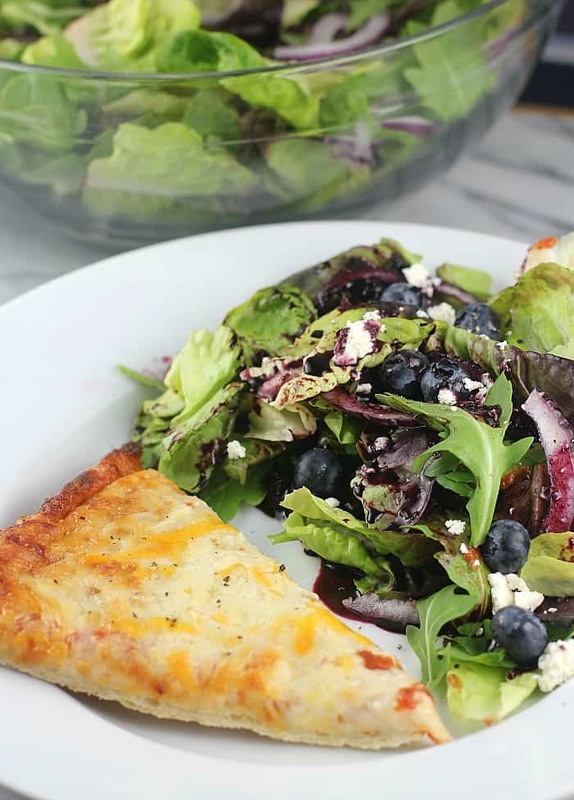 A sweet yet simple salad with blueberries and feta cheese paired with Red Baron pizza makes a perfect weeknight dinner solution. So where are my MOMS??! Let’s do one big virtual fist bump ladies because we rock in that wearing yoga pants, hair in a messy (but still pretty cute) little bun, haven’t-shaved-since-last-date-night, way that we do. Just take a second and think about what we do for our families, and especially the random/crazy/often gross stuff that just happens and we can totally deal. The stuff we end up laughing about later. I’m not talking about the routine, I am talking about the unexpected …but even THAT’S routine. Because, that is being a mother. For example (and please share your own stories at the social hub HERE), I was once snuggling with my son when he was like 2. Kissed him on his little nose, “I love you so much”. Then he looked in my eyes and vomited right into my mouth. Ah yep. Show of hands, who can relate. YOU are my people. See, I have often talked about how busy my house is. And a lot of it is self-inflicted of course. The kids sports, travel for those sports, the assorted activities, the near-constant taxi-service I provide, the late night runs to Walmart for that poster board needed for a school project that they knew MONTHS ago was due tomorrow…. stuff like that. But I take it to the n’th degree because on top of all that, I train for triathlons, I volunteer, I do stuff. And I am a magnet for random bits of chaos. Also, I am kinda nuts. Turned on the clothes dryer with my cat inside. I have gone to a school open house covered in sea turtle poop. I am on a stranding team and had just come from a rescue. I have helped my kid look for a piece of candy after I had actually already eaten it. 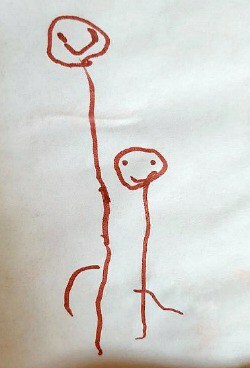 I once called the dentist’s office to schedule my daughter for a cleaning. Took a couple minutes with the receptionist before I realized I had called my gynecologist’s office. ^^^This was a day after when my husband and son were out of town, but we were signed up to bring snacks for my son’s baseball game. I still delivered the snacks, but tripped and fell flat on my face in front of the entire crowd when I got there. 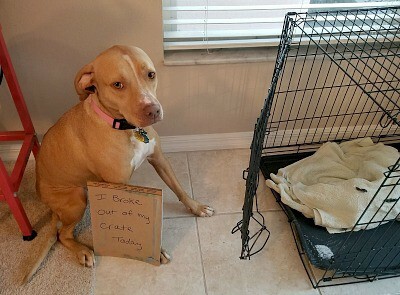 Then last Saturday a week ago… the Poopocalypse. So, I take our dog Sandy and go for a run. She is a rescue and has her quirks like the rest of us, so of course we adore her. …A couple miles up the road, my dog spots a rabbit. By that point she had pooped, so I was running with a poop bag in the same hand that was holding the leash. …Dog takes off after the rabbit causing the leash to rip off my hand exploding the poop bag. I get the dog and jog home, gingerly holding the leash between my thumb and forefinger. Because poop hands. 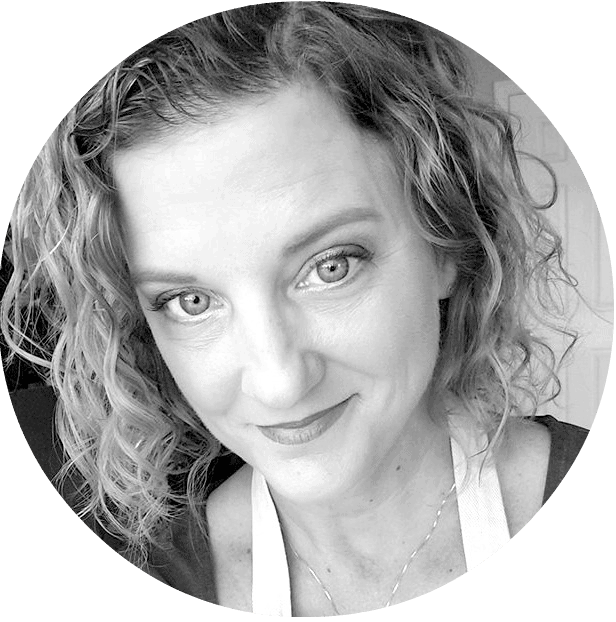 Once home, where I would normally get out my phone and use the smart app to open the garage, instead I went to my front door – Because poop hands – knocked with my foot and yelled for my son to come open the door (my husband was asleep). But then he’s all like stranger danger, runs ….Me: “IT’S MEEE, MOMMY! LET ME INNNNN!” …which ultimately he did but jeesh. And so we keep on and somehow make it all work. Life is not perfect, especially with a family, but I love how perfectly imperfect my life with my family is. You know one thing that I have really been doing more and more is letting myself off the hook for cooking dinner. 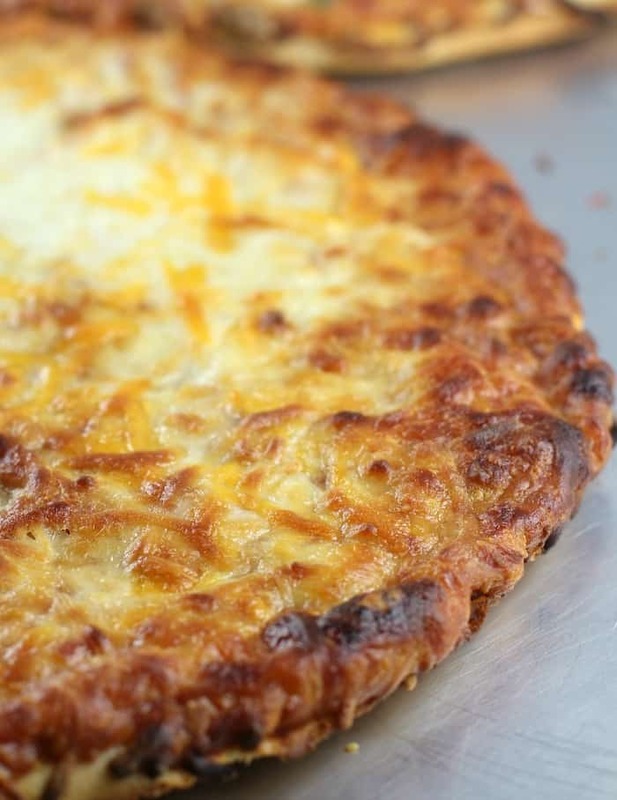 I am giving myself permission to make the easy pizza or quick dinner. Not all the time, but at least a couple times a week. Especially when it’s been a day where I am just like “You know what? I do not feel like cooking today!” [to be read in a totally triumphal tone 😉]. 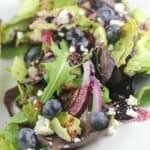 Enter this Blueberry Balsamic Salad recipe, Red Baron pizzas, and my solution for these nights where me actually preparing a full meal has no chance of happening. 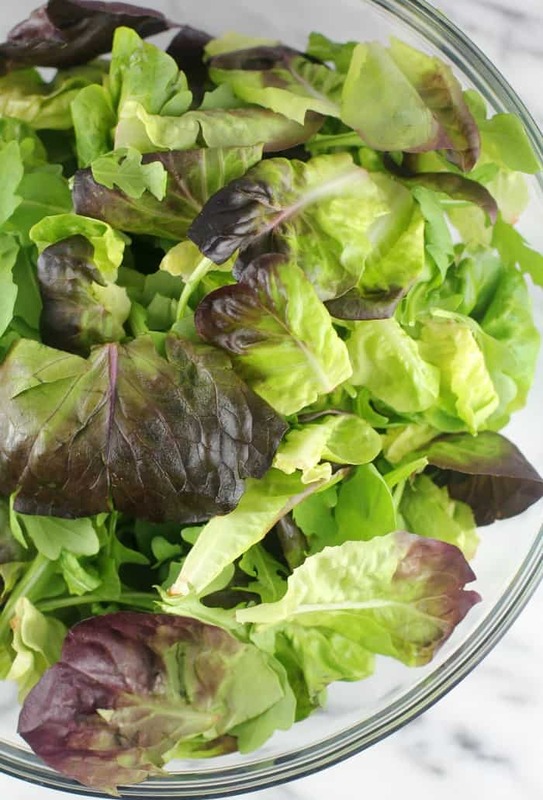 And my key is to make a simple, yummy salad (in this case, sweetened with blueberries to get even the picky eater to eat) and serve that with EASY Red Baron pizzas. 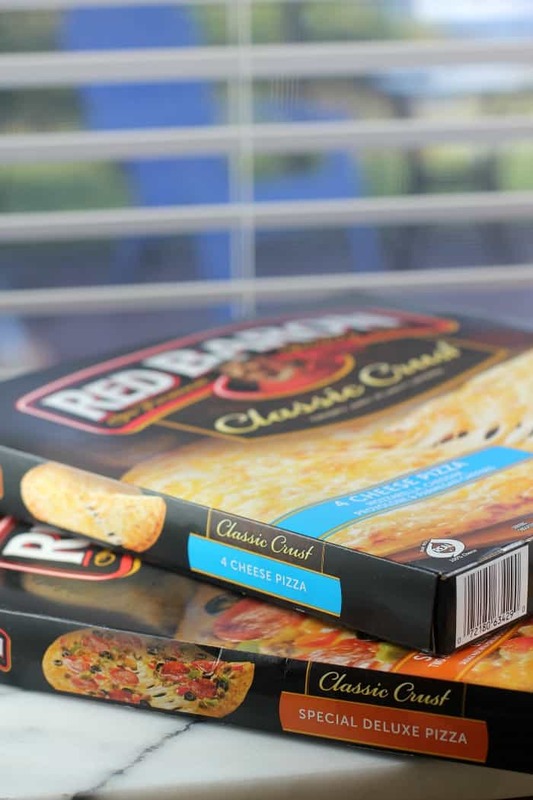 So when I do the frozen-pizza-with-salad-on-a-weeknight-thing, I get two pizzas to make everyone happy, like the Red Baron® Classic Crust 4 Cheese for the kids and Red Baron® Classic Crust Special Deluxe for my husband. I’ll have some of both – I have just lifelong loved Red Baron’s. Besides, it’s pizza! My favorite food. 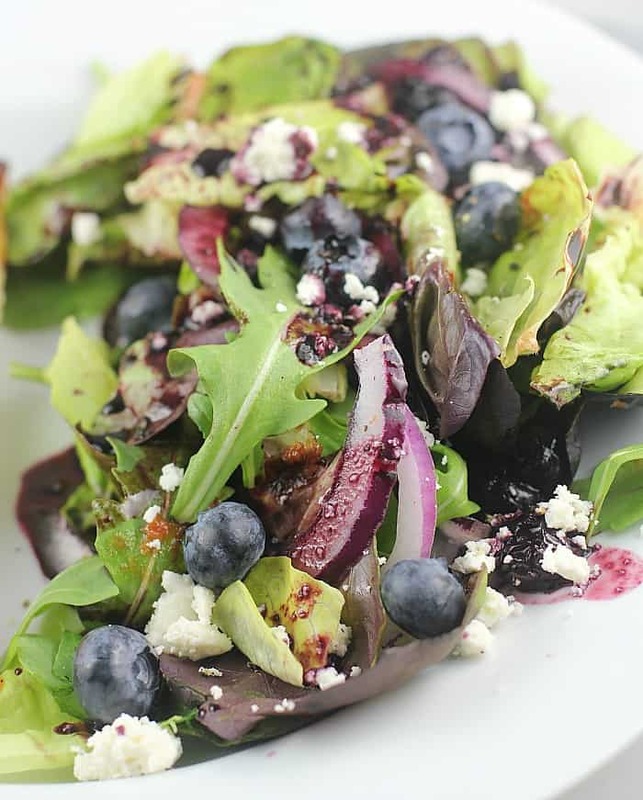 This Blueberry Balsamic Salad brilliantly preps up easily in the time it takes to cook the pizza. 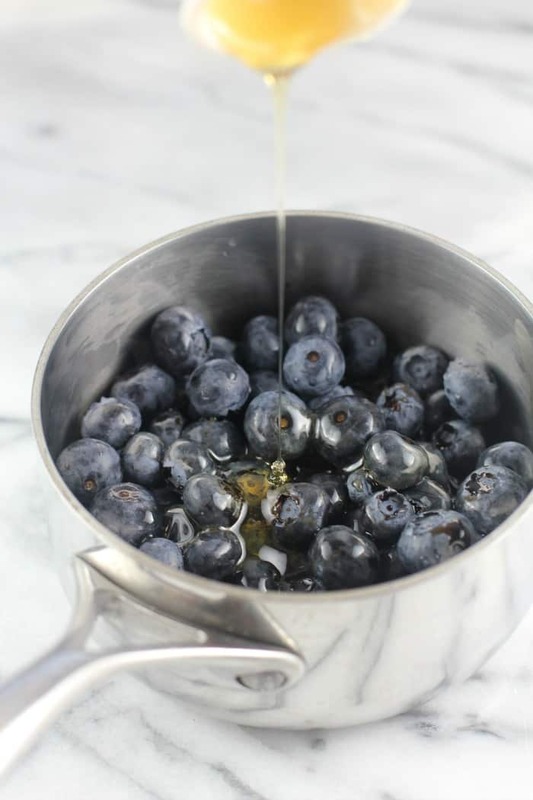 First, we thicken up balsamic vinegar to make it awesome, and sweeten naturally with a little honey and fresh blueberries. The berries burst and add natural pectin to thicken the sauce and sweetness to cut the acidity of the vinegar, so we don’t even need to add any oil or anything. Then we throw together our greens, some onion, and feta (or cheese of choice). That’s it! 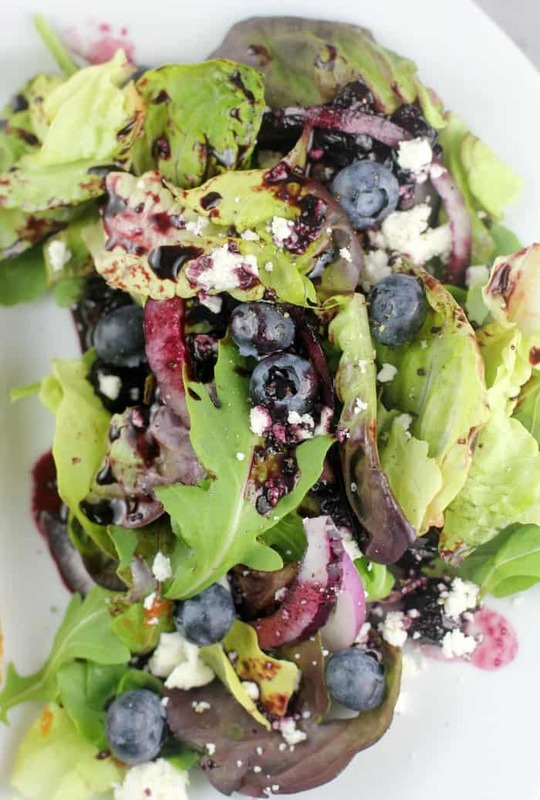 Just top the salad with the Blueberry Balsamic dressing, throw on some fresh blueberries and cracked pepper to make it special – but literally spend only 2 seconds doing so – and we’re good. I have made this recipe a bunch of times now and I love it because not only is it healthy and easy, but with that blueberry sweetness, even the younglings will eat without complaint. So that’s it folks. An easy salad paired with even easier Red Baron pizza. To proudly make your weeknight dinner delicious, with no stress, call it good, and enjoy the extra time with your family. Put half of the pint of blueberries in a small saucepan with the balsamic vinegar and honey. Heat over high heat, stirring regularly, until the berries burst, the vinegar reduces, and the whole thing because saucyyyy. Remove from heat and set aside. Toss together the greens, onion, and feta cheese. Allocate to your serving plates. Top with Balsamic Blueberries as a dressing, and garnish with the remaining fresh blueberries. Top each with fresh cracked pepper. Serve immediately. Yields: 4 servings. 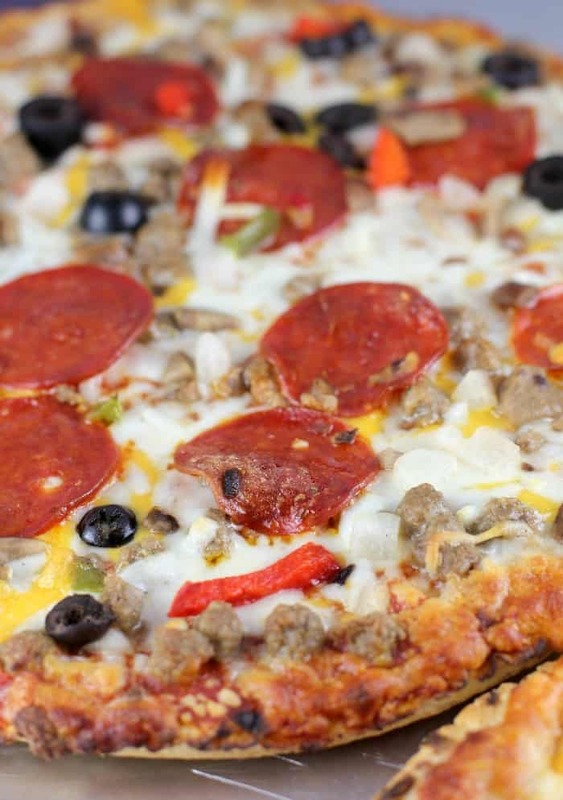 For more dinner ideas with Red Baron pizza, visit the social hub HERE. And leave me a comment! What is your tip to make weeknight dinner easy? My toddler would go crazy for this meal! He is obsessed with pizza and blueberries! Oh my gosh. 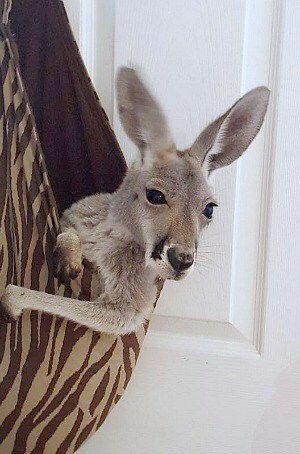 Moms do end up in some of the strangest situations. The chaos and messes are definitely worth it though! I love putting blueberries in my salad! Sucha great way to add flavor and good stuff to your meal! I feel a little bad laughing, but we’ve all had those experiences. My daughter decorated my parents’ textured wallpaper with poop. Totally needed this salad after that one. 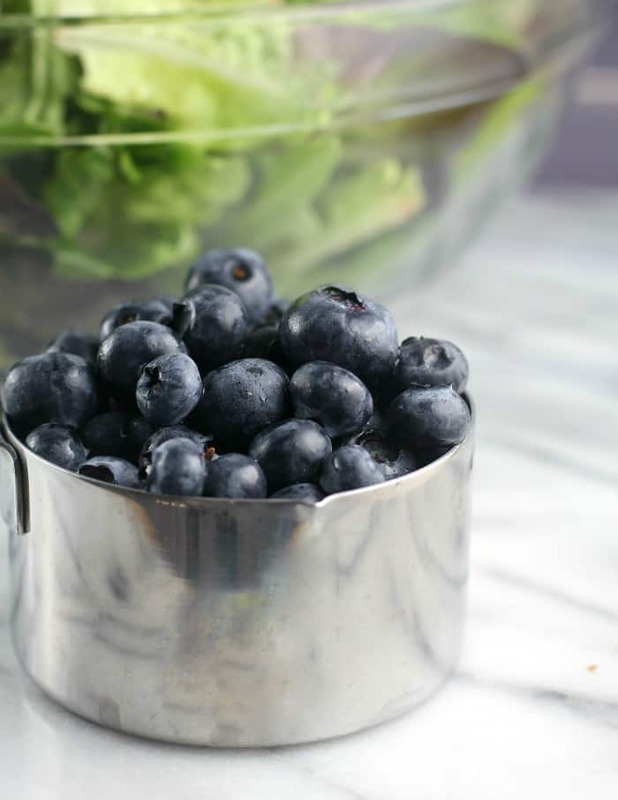 I love blueberries so I have to give this salad a try. I’ve not had feta cheese but can give it a try. Oh we all have our share of unforgettable experiences in raising kids. I remember my then 3 year old son’s shout, “Mom, the fridge is yellow,” which puzzled me because our fridge was immaculately white. Guess what. He painted the fridge yellow! Thanks for a great read and a recipe too! I seem to always enjoy a pizza and side salad. I’ve eaten Red Baron pizza for years! You absolutely can’t forget the glass of wine and a movie. Nothing better than pizza and a salad!!!!!! One of my go-to meals for when things get crazy busy around here! !